BAYHAM: Will Scalise Be Speaker? The New Orleans area has had some close calls with the top office in the national legislative branch. Democratic Hale Boggs had attained the post of Majority Leader after the 1970 mid-term elections and in October 1972 traveled to Alaska to campaign for US Representative Nick Begich. The effort was to not only help the Democratic at-large congressman hold the seat for their party but to also sway Begich over to his side of his party’s caucus in preparation for a future bid for House Speaker. Their twin-engine plane vanished on October 16th and despite one of the largest search and rescue operations in American history, no sign of the plane wreckage was ever discovered. Over twenty-six years later, another resident of the “504” seemed poised to assume the speaker’s gavel when Congressman Bob Livingston was elected by the GOP House caucus as speaker. But the Metairie Republican backed away before the chamber voted after admitting an affair in a gambit to pressure then-President Bill Clinton to resign in the midst of Clinton’s own scandal. And now Minority Whip Steve Scalise, who currently holds the seat Livingston once occupied, is in the conversation to potentially replace retiring Speaker Paul Ryan of Wisconsin. As of this moment, the favorite to succeed Ryan is California Congressman Kevin McCarthy, due in no small part to Scalise’s announcement that he would not challenge the current Majority Leader for the post. And if McCarthy were to win speaker, Scalise would be in a prime position to slide up a notch to Majority Leader. Though from a decidedly unfriendly state to Republicans (and the Bill of Rights…and national sovereignty…and every other concept that makes us not Europe), McCarthy hails from the stalwart GOP enclave of Bakersfield- the most conservative large city in the state. McCarthy also has a grassroots political background as a former chairman of the national Young Republicans from 1999-2001. As someone who served on McCarthy’s board during his tenure as head of the YRs, I can attest that at no time did the future congressman attempt to move the organization or the party to a more centrist ideological path as his primary focus was on young voter outreach. However, when considering the hell a deranged leftist political activist put Scalise and his family through during an ambush on Republican congressmen at a suburban Washington ballpark, seeing Scalise standing at the speaker’s rostrum would send a powerful message to radicalized political elements who are willing to embrace violent measures to create political change in America. The assassination attempt wasn’t the first challenge Scalise has had to face. Prior to the shootings, the establishment media attempted to irradiate Scalise through ludicrous insinuations that he was in league with a fringe (and politically irrelevant) organization. The Fourth Estate was determined to wreck Scalise despite that there was not a single shred of evidence from his over two decades of legislative work to indicate that the Old Jefferson Republican had any sympathy to the agenda of ethnic supremacists. Even Scalise’s Democratic colleague Cedric Richmond vouched for Scalise’s character in the face of the smear campaign advanced by leftist political activists and their willing and giddy allies in the press, who went into overdrive to advance the bogus narrative against Scalise. Of course this was the same media that deliberately buried a photograph of a meeting between Barack Obama and the racist and anti-Semitic Nation of Islam leader Louis Farrakhan. Apparently they didn’t want the American public to get the wrong idea about their progressive champion Obama. Scalise is a well-grounded personable politician who is sincere in his conservative philosophical convictions. Prior to making the big jump to Washington, Scalise championed a number of conservative bills in the state legislature including a bill that protected gun manufacturers from frivolous lawsuits that attracted the personal support of Hollywood icon and NRA President Charlton Heston. 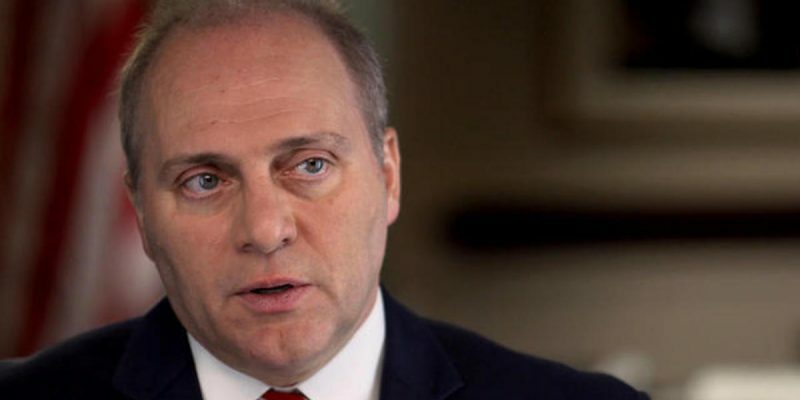 There are few elected officials who have been tested to the degree Scalise has and his election as speaker would be a huge win for conservatives and Louisiana. Boggs and Livingston saw their hopes of becoming speaker meet unfortunate endings; hopefully Scalise will be able to eventually ascend to the prestigious office either immediately after Ryan leaves- in the event McCarthy opts to stay in his current office- or a few years from now.